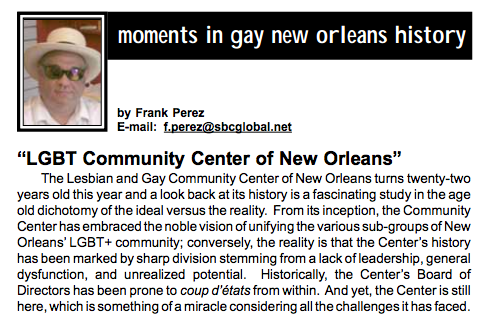 Historian, author, and sensational Gay New Orleans Tour guide Frank Perez wrote an article on the history of the LGBT Center, including some of our rockier moments, and where we’re headed moving forward. We appreciate his honesty, like Toni Pizanie before him, Ambush writers have offered some tough love to the Center; we feel that public scrutiny is an important part of having a Center that is accountable to all parts of the LGBT community. We hope we can exceed expectations. If you have input on the Center, please attend our community meeting in June- join our newsletter and stay tuned for details on this important community-wide event.